Lily Boon loves playing the piano, especially when she is surrounded by crowds singing. Lily Boon learns most of the songs by listening and can usually play without a score. 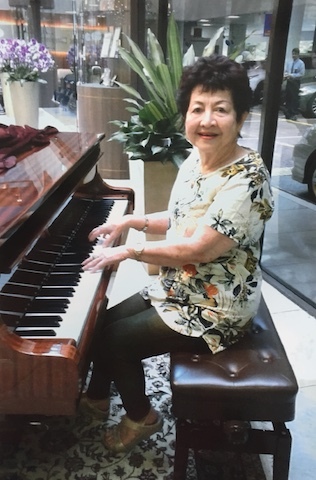 Lily Boon, 79, is a magnet to a piano. Two years ago, on Orchard Road during Christmas season, there was a street piano outside Takashimaya in Ngee Ann City. Most people would simply pass by, but not Lily. She got on it and started playing. Passers-by crowded around her to enjoy the music and sang along. She remembers that when she played a Tagalog song called “Dahil Sa’iyo” (“Because of You” in English) for a Filipino woman in a wheelchair, she was so happy when she heard the song because it reminded her of home. Another time, she played a Malay song, “Getaran Jiwa” (“Soul Vibrations” in English), composed by Malaysian songwriter P Ramlee for another woman. She really enjoyed it as she reminisced that was the song she sang at her wedding. 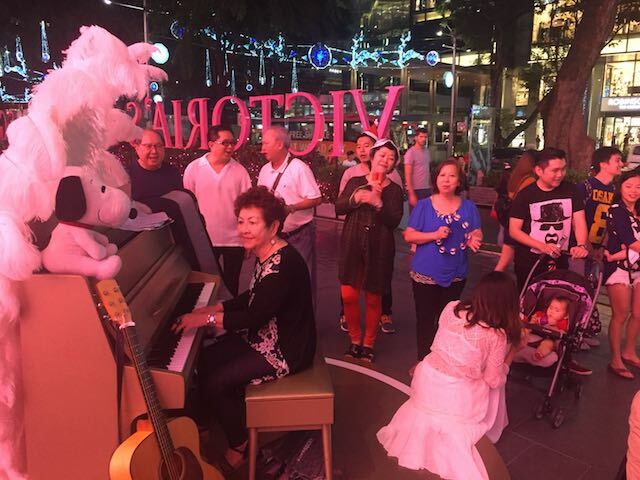 While the street piano in Orchard is long gone, Lily has found ways to keep people smiling and singing. These days, you can see her playing the piano at other locations such as at churches and home parties, and enjoys every minute of it, especially when she is surrounded by a crowd that loves it as much as she does. She plays Christian songs and mostly evergreens like “Red River Valley” and “By the Light of the Silvery Moon”. She even takes regular requests from her audience wherever she goes. Lily playing on a street piano in Orchard Road. She started a karaoke group called Silver Connection with a friend. The club has over 50 members now and they meet at Potong Pasir RC once a week on Tuesday evenings. She also keeps busy once a month with a “kopi chat group” comprising over 20 seniors. “It is important for seniors to stay happy, remain active and lead more meaningful and fulfilling lives,” said the mother of two. Though she lost her husband 20 years ago, she believes wholeheartedly in staying active. She once attended a modelling course, after which she performed a catwalk at an event for seniors. She was a finalist in a singing competition and hosted several social events.She even took up drama lessons at the Necessary Stage’s Theatre for Seniors and played several calefare roles on stage, TV and in a movie. Nowadays, she takes on part-time work as a simulated patient at various hospitals where she acts as a patient and simulates medical symptoms. This helps the faculty test their medical students and new doctors on their communication skills. She still meets up with her classmates from Primary One and her ex-students, some of them who are now grandfathers and grandmothers. To also add to her repertoire of songs, she goes to country clubs and pubs to listen to music, and is often invited up on stage to play the keyboard at jamming sessions. Lily shared that she hopes she can introduce and share oldies to the younger generation. “When we go, all the old songs will die with us. It is a waste that these songs might be forgotten.” Recently, she teamed up with a National University of Singapore student who sang oldies while she accompanied him on the piano during a book launch. Nothing can stop her from playing a tune. In September last year, she had a fall and was in Alexandra Hospital for two weeks. During her stay, the nurses took her down in a wheelchair as she could not walk at the time to play on the public piano in the hospital lobby. She was all too happy to entertain the visitors and hospital staff.